Share your loved one’s story with photos. 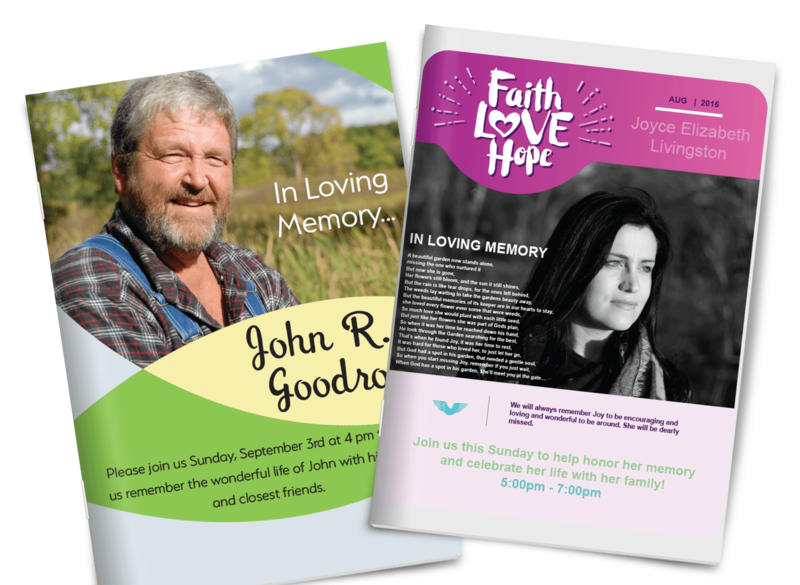 these funeral programs and life story memorial photo books are an excellent way to share and celebrate the life of the deceased with family and friends by telling your loved one's story with photos and text of memories, stories, events, honors, achievements and other interesting material. Can be shortened to, say, 8 pages, and still do a good job of celebrating the life of the deceased, as well as giving the service attendees necessary details about the service and related events. Typically you're going to have a page with the schedule of speakers, music, and readings, plus several pages with photos and highlights from their life, sometimes the text of a song, poem, or reading, and a page that talks about surviving family members, and how and where guests can donate in memory of the deceased. Memorial Photo Booklets are for family and those people who were closest who may really appreciate a photobook to keep and look at over the next few months, years and possibly treasure forever.Photo books help those family members reconnect with their memories of the loved one when they find themselves missing them over the next few years, especially at holidays and birthdays. Get Started Now! We offer professional quality 8.5 x 11 and 5.5 x 8.5 programs. Printed in vivid full color on 100# gloss or matte text paper and 80# gloss or matte soft cover, which, the cover can be UV coated to give that luxurious high gloss finish. Family and those people who were closest who may really appreciate a photobook to keep and look at over the next few months, years and possibly treasure forever. Photo books help those family members reconnect with their memories of the loved one when they find themselves missing them over the next few years, especially at holidays and birthdays. How and where guests can donate to charities in the memory of the deceased.